Kathmandu city is my home town. I was born and brought up there. My father built his first house in the religious town of Swayambhu. I spent my beautiful years of childhood in this town. I have fond memories of times spent there. I was born in the mid 80s. We played lots of indoor and outdoor games while growing up. Although I have only one elder brother, we grew up playing childhood games with the kids in our neighbourhood. We played games like lukamari or hide and seek, dhyappa or touch and run, 7 stones, guccha or marbles, bhada kuti(literally translates to utensils, a play game like tea party where children play with miniature utensils) and several other games in which we pretended like we were adults, my favourite one was playing a married woman or playing a Mom :P. I was the youngest in the group so I never really got to participate in a more challenging game like dhyappa, lukamari and 7 stones. They would let me play but I would be a dudh-bhat(literally translates to milk and rice) or chusya musya(literally translates to small bits) in these games. This was because I could not run as fast as them and would cry if I was out of the game too soon. Being a dudh-bhat meant that I could play on even though I was out of the game and no other players took me seriously in the game. After a while I would realise that no one was chasing me or looking for me and I would start to cry. This was the reason my brother was embarrassed of me and he rarely took me with him to play. So, I usually played bhada kuti alone in the terrace. I often used to ask Mom to lend me some rice and I would use some shrubs as veggies and play my game. Growing up in the Swayambhu area, we went to the nearby museum during weekends, we swayed in the huge rotating prayer wheels in the Gumba(Monastary), chased monkeys and sometimes they chased us back. We never missed to visit the Swayambhunath temple during special occasions like Buddha Jayanti, Saraswati Puja, Guru Purnima and whenever we passed an exam. Our school was in walking distance from home, so I used to walk with my brother to school. When we were young, my brother was very shy and I was the opposite. He never allowed me to talk to him and I was never to come to find him during school hours. He asked me to wait outside the gate after the school was over and we could walk back together. But I was not of the kind who would obey rules :P. I would go outside his class with my friends, point at him and tell my friends that I had an elder brother and run back to our playing area. Sometimes, I would go to the playground where he would be playing, poke him and run back to the class. At home my brother was different. He would play with me, teach me how to turn on a radio, show me his video game but at school it was a different story. We lived in Swayanbhu area until I was in the 3rd Grade, I think. After that, we moved to another town and changed school. Another thing I remember about being in that area is the food like gwara mari(a kind of fermented and fried pastry), momo cha(dumplings), aloo sandheko and many more. I will write a different post to talk about this. I wish I could post the picture I have in my mind of those times. Last year when we were in Kathmandu, we drove passed this area. Our house was still there and it was the same little house with yellow paint but the locality has changed drastically. There are a lot more people and many more houses now and everything looked so small and crowded. So, this is a slice of my life from my childhood. Hope you guys will enjoy reading it and do share about your own childhood experiences and the games you played as kids. Please watch and share the video to support Heather and Cameron on their quest to spread awareness regarding Mesothelioma. Thank you. What makes our relationship work? A and I have been together for almost 2 years and we’ve been married for about 5 months now. Its been a jolly ride since we’ve been together and I love my life with A. Almost all my friends in this blogo-sphere have a rocking relationship with their spouse or husband, which reminds me how lucky I am to have a rocking relationship like you all :). Every couple is different and each relationship works in its unique way. Today I want to share what makes our relationship work. We try not to judge each other. There was a time when I thought that A was of a certain type :P. At that time I didn’t know him that well and was judging him based on the “circumstances”. But as I got to know him, I learnt how wrong it was to judge someone. Once I let this initial ice break, it has been a pleasure to discover him. He is not a perfect person and neither am I. We both know this and we’re perfectly ok with each other. We are friends first. On top of everything else we’re friends first. We enjoy each others company a lot. We are not the type of friends who are all praises about each other. He is my first and foremost critique. Well, it doesn’t feel good to be confronted for your not so good side but A confronts me anyway. At first, I may be upset or even argue but at the end I always come out a better person. We do not sugar coat each other on unnecessary things. If something needs to be said, we say it but we also explain why and make each other understand and often we end up smirking on what an a** we’ve been at a certain situation. We love and respect each others family. When you get married to a person, you marry the entire family, even the extended family. We make it a point never to small talk about our respective in laws. We both understand its a very sensitive area. I love my parents and so does he, we both know the importance of family and we never judge each others family about the petty little things. This way, I can talk about my own insecurities regarding my parents with him and vice-versa knowing that we’re just human after all. And this applies not only to our families but to our friends too. We adapt. At first when I met A, he didn’t know anything at all about cooking. When I mentioned the word cooking at home, he used to get irritated for having to spend his evening doing something as silly as cooking when you could easily order anything from outside. But we’ve come a long way since then. A not only helps me to cook but he has started to enjoy cooking now. On the other hand, I was very introverted and shy about sports. I didn’t know how to play any outdoor sports. But now, we play badminton every other evening and I enjoy it a lot. We have our freedom. If we go to a restaurant, we don’t hesitate to order the dish that only one of us likes. Although this freedom was not easy come, we both have learned to understand that we are two individuals. It may sound silly to put this point here but for us its definitely worth a mention. At the beginning when we were dating, I used to be annoyed when A didn’t eat the food I ordered for him or didn’t say “I’ll have whatever you order(for me)”. He always said,”Ok lets order that but I’ll have this one today”. I had seen all my friends and their spouses having no problem at all when their wives/girlfriends ordered food for them. But A is not like that. He has always known what he wants and this goes for what he wants to eat as well. We compromise. Yes we do compromise. One example is the kind of movies we want to watch. A is fond of action thriller, horror and detective movies. I am fond of drama, reality based and romantic movies. I get tired of watching all the violence on screen but I watch it anyway. A feels sleepy during the drama movies but he watches it anyway. Apart from this, we compromise on many more things without remorse and this is what makes our relationship stronger. And the list is longer but these are the basics that make our relationship work. However there are things that we’re still learning about each other and we are still on the phase of discovering each other. A relationship brings discipline in life, it teaches us to live above ourselves and think of another being first. I feel blessed to have A in my life. It all makes sense, he is a perfect match for me. The other day we had a little dispute with our friend. All of us were saying a thing or two but he was silent. When I asked him why, he talked about Gautam Buddha’s teachings by saying, “We all could win by arguing but before we argue we have to be able to differentiate if the argument is worthy of what comes after it”. He went on to say, I am not against putting our points forward in an argument and we could be telling the truth but what we have to learn is to rise above and think is it really worth it? Will it really make things better? If it does, I would be the first one to voice out but if it doesn’t whats the point? I could not refute him and I was glad about it. Above all, we both have learned to be a better human being from each other and this is what makes our bond even stronger. Travellers are full of stories. Everytime we visit a new place, we see and learn new things and who doesn’t like to share unique experiences? We all do in one way or another. I love talking to my grandparents to hear about their experiences, it gives me an opportunity to peek into the historic era they lived in. Unfortunately, I never talked with Baajya about his travel tales when he was in this world(and I don’t know why). But whenever I am with my Hajur Bua, I pester him to tell me about his travel tales. One of the things I’m most interested in knowing is about his journey from my ancestral home in Dhading district to Kathmandu, which took several days to complete during those times. I have asked him many times to tell me about his journey from Dhading to Kathmandu and every time I listen to this story, it amazes me more and more. My Jiju Bua, married his eldest daughter to a scholar in Kathmandu. After Thulo Fufu was married, it opened a door for my Hajur Bua to travel to Kathmandu. During those days, it was very common to send your children to stay at your relatives’ place to study. So, Jiju Bua sent Hajur Bua to study in Kathmandu city as the only modern school in Nepal was located in Kathmandu(Durbar High School). The journey from Dhading to Kathmandu was made on foot. Usually a bunch of people who had to go to the city waited for a convenient time so that they all could travel together in a group. These people were traders who brought in everyday commodity to the village, students who studied in the city or people who travelled to visit their relatives in the city. A journey would typically start by Juju Muwa putting tika on Hajur Bua’s forehead and blessing him for the successful completion of the journey. Hajur Bua said that she would also pack a small bag of rice, a bottle of ghee and some dried vegetables for the journey. They would start from the hilltop and descend downwards to catch a road that would connect them to the capital city. I don’t exactly know if it was a “road” or just a walking trail because every time I ask Hajur Bua to describe the road, he would say it is not remotely close to the present day highway but it was a well establish trail which the traders and travellers would use frequently to travel from India and other parts of Nepal to the capital city. 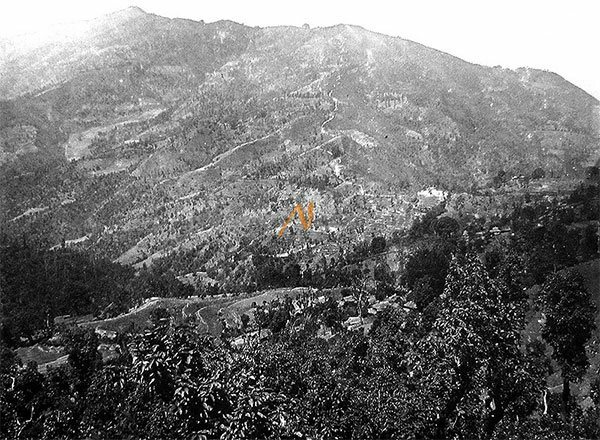 The descent from the hill was mostly the famous hilly terrain of Nepal in Dhading district. If they start the journey in the morning, by evening they would reach the lowlands which is called “Besi” in Nepali. They would have to spend the night at the Besi as travelling during night time was not possible. On this Hajur Bua said that during those days, it was very important to reach Besi before the sunset as there would be fear of wild animals after the sunset. On reaching Besi, they would request for “Bass” or shelter to the village people at Besi. The travelling group would then borrow utensils from them, fetch firewoods in the nearby forest and prepare their meals of rice, ghee and dried vegetables like Gundruk that they have brought along with them. I asked Hajur Bua if the village people asked anything in return for staying at their house, to this he said, they would leave the remaining rice/ghee if the journey was of one night and if not they would give a portion of the commodities to them. I was truly moved by this system based on understanding and basic human instinct of helping each other. I also inquired if there were any robbers or if they were scared of anything while travelling. On this Hajur Bua smiled and said we didn’t know of anything called as robbery, the fact that one person could rob another person was alien to the people of Gaun and Besi(village and lowland). At this point, both me and Hajur Bua drifted into the conversation of how the people of Nepal have changed over time. Then he giggled slightly and said, there was no fear of one human harming another human but we were scared of Ghosts and Monsters. There were several stories of fire monsters who walked on forest after sunset called “Raken Bhoot” and some other monsters that he talked about which I do not re-call at this point. I slightly teased Hajur Bua and asked if he believed if they existed. On this he said smiling, I don’t know if I believed in them or not but our elders always shared stories of how they encountered certain Monsters and he was definitely scared of them then. Going back to the journey, after spending the night at Besi, they would set off early at dawn and head to the capital city. It would take whole day for them to reach the main road that would link them directly to Kathmandu. Again, they would take shelter in some village, cook their food and spend the night there. The next day, they would start their journey early in the morning. On this day, they would meet many travellers/traders going towards Kathmandu. Most of them would be carrying different kinds of goods from India. Hajur Bua said with excitement, they even carried vehicles in large wooden logs during those times! Then he continued, the last few hours of the journey were the toughest as they had to cross several hills before they could enter the Kathmandu valley. Some would fall sick and they would find people resting as some of them had walked for many days at this point. Then by the evening of this day, they would reach Kathmandu valley crossing many hills and forests. And this is how my Hajur Bua came to the capital city to study. He further said that Kathmandu valley was nothing like what it is today. There was very less population in the valley and places like Maharajgunj and Kamaladi was a forest. Since Thulo Fufu’s house was in Thamel, he stayed there for some years to study at Durbar High School. Next time I visit Hajur Bua, I will surely asked him to tell me the story about his life in Kathmandu during those days :). I love spending time with Hajur Bua to hear about many of his simple yet profound experiences of his times. I think my Hajur Bua was around 14-15 years old when he made this journey to the capital city on foot. After the story, he would say, how times have changed now and how everything is so convenient these days.